Today, I'm writing about the lessons I learned from the classic film noir Double Indemnity (1944), starring Fred MacMurray, Barbara Stanwyck, and Edward G. Robinson. 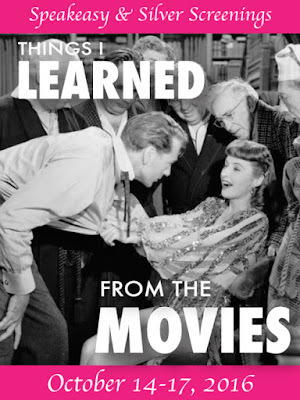 This article is part of the Things I Learned from the Movies blogathon hosted by Speakeasy and Silver Screenings. There are many lessons old Hollywood fans can learn from film noir such as the perils of hitchhiking (Detour, The Hitch-Hiker, Kiss Me Deadly) and that having James Cagney as a table mate at the prison canteen would be a real drag (see this scene). But, thanks to the strict moral guidelines of the Motion Picture Production Code, the greatest lesson I learned from noir is best described by the old adage "crime doesn't pay." In fact, a lifetime of watching classic movies has left me with the knowledge that even minor offenses can lead to a downward spiral of lies, retribution, and self-loathing that will inevitably be accompanied by a foreboding musical score and deep focus cinematography. 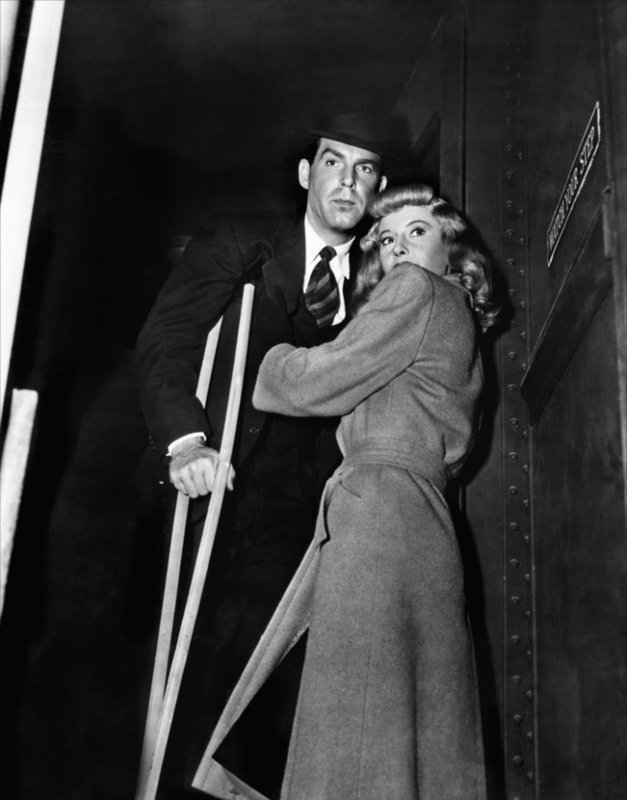 One of the best noirs is writer and director Billy Wilder's 1944 classic Double Indemnity. 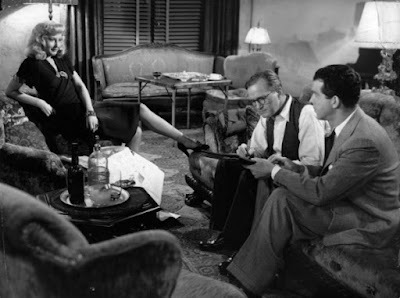 If you haven't seen the movie (and, if not, what are you waiting for) Double Indemnity tells the story of insurance salesman Walter Neff (Fred MacMurray), who falls for the ankle-braceleted charms of Mrs. Phyllis Dietrichson (Barbara Stanwyck) while making a sales call. The pair are soon so hot and heavy that they are planning to murder the blissfully unaware Mr. Dietrichson (Tom Powers) so they can cash in on his large life insurance policy. Unsurprisingly, things don't go exactly as planned for Walter and Phyllis, which provides noir fans with an one hour and 50 minute lesson on the wages of sin. 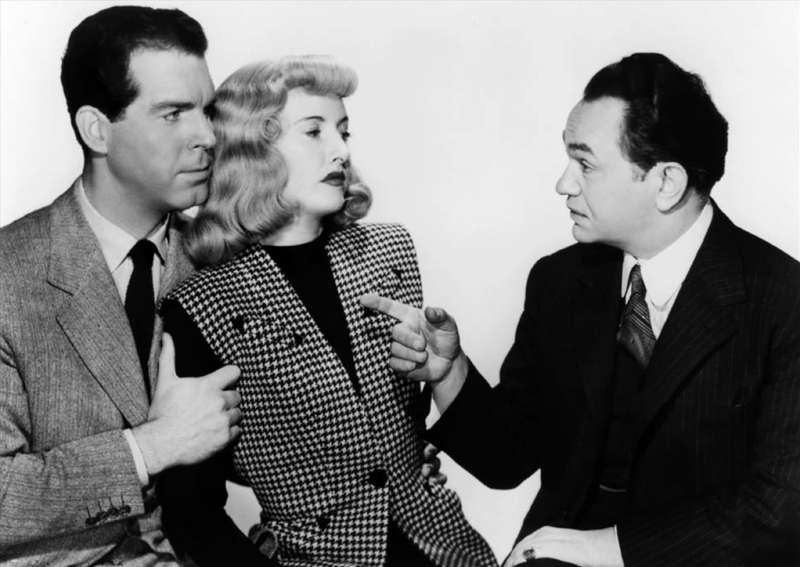 So, without further ado, here's the five lessons I learned from Double Indemnity. If you need to get several first-degree felonies off your chest while slowly bleeding to death, the best thing to do is fire up the dictaphone for an interoffice memorandum. It will certainly help if you've got snappy lines like "I didn't get the money, and I didn't get the woman" and "How could I have known that murder can sometimes smell like honeysuckle?" If a blonde wearing nothing but a towel and an ankle bracelet answers the door, just turn around slowly and walk away. Sure it might seem like she's just inviting you in for some iced tea and an innocent chat about the California speed limit, but soon you will be giving up your sweet bachelor lifestyle of drive-in dining and solo bowling for murder planning in the canned goods aisle of the grocery store. In most cases signing duplicate documents is fairly innocuous, but, just in case your wife and her new boyfriend are planning to murder you and then dump your still warm body on railroad tracks, it's best to take a gander before writing your John Hancock. Trains in the 1940s were not handicapped accessible, AND they provided really, really terrible alibis. A lifetime of old movie watching has taught me that no matter how well-laid your plans, no matter how careful your schemes, there is some dedicated public servant out there who literally has nothing better to do than discover the cold, hard truth about your dirty deeds. So, with those lessons in mind, here's to a life of clean living! 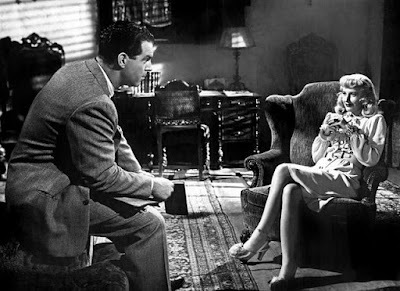 Double Indemnity will air at 2 p.m. Dec. 21 on TCM. It is also available on DVD, Blu-ray, and video on demand. Double Indemnity is one of my fave movies, and I absolutely love your essay on Lessons Learned. Even though you've written these in an amusing style, the lessons are valuable. See? Whoever said black & white movies are a waste of time? Thank you for joining the blogathon with this terrific look at one of the all-time great films. I agree about valuable lessons learned. The best noir on the theme crime doesn't pay is The Asphalt Jungle. I always thought it would be a blast to have noir characters do an advice column :) and your post shows why. Just think how many noirs would never happen if the poor sap just turned around and walked away! ha Thanks for joining in the blogathon! "Mistakes I've Made" by Walter Neff would be a good read. I'm laughing, but you scared me straight! I don't know what exactly you have done to my next viewing of "Double Indemnity", but it will definitely be different. I think, because it's Billy Wilder, there's a lot of stealth humor that comes out in Double Indemnity after repeated viewings. Double Indemnity is one of my favorite movies. Your blog made me both laugh and remember why. I would never have fallen for Phyllis' hook, but then, I'm jaded by years of reality. I love the take on this movie. I've seen it and the less than stellar TV remake with Richard Crenna and Samantha Eggar (now there's a woman I wouldn't mind her hook) so many times I've lost track. Good posting. I know I'm way over thinking this, but I think Walter is interested in Phyllis at first because she's married and he thinks they can have a casual relationship until he was in way, way too deep.